The Sullivan Center for Children is a comprehensive outpatient treatment facility founded in 1989 with the goal of providing quality outpatient psychological and psychiatric service to children, adolescents and families in the Central Valley. Our Center offers five general categories of service. For details on each of our points of service, use the tabs below. Our philosophy is to treat the whole child within the systems he or she is involved and to facilitate an integrated approach to the child's care with family, and other professionals working with the child. Following an initial evaluation our therapists will outline a treatment plan, including the working diagnosis, goals and objectives, frequency and type of sessions, and the estimated duration of treatment. Therapy is a complex process in which healing and behavior change come about through regular sessions involving the child, family and therapist. Our staff will work to find the most effective type of interventions given the symptoms, diagnosis, and family needs. The diversity of our clinicians' expertise enhances our ability to bring to bear a wide variety of theoretical approaches ranging from psychodynamically oriented strategies, to evidence-based approaches, to medication management. We also have the capacity within the Center to provide help with individual parent issues and/or marital issues that affect the child and family. 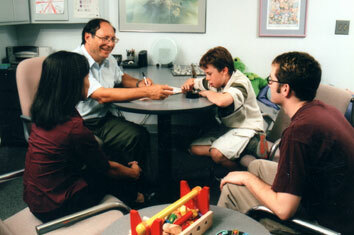 This is done in coordination with the child's therapist so as to provide a cohesive approach to treatment. This form of therapy is essential in the treatment of young and some older children. Play is the primary medium of expression for children, the primary activity through which conflict is resolved, and the primary mode through which adaptive skills are mastered. Children communicate their experiences and conflicts easily through play. It is the gateway into the child's inner world, and it is one of the most powerful mediums we use to help children heal and mature psychologically. This is a verbal process in which, within the context of a therapeutic relationship, clients learn to identify problems, to identify feelings, to control impulses, and to cope with life's difficulties. Clients have the opportunity to work through traumatic experiences and difficult life circumstances and to develop healthier adaptive and coping skills. The process and goals of group therapy are different than those involved in individual therapy. Group therapy can be appropriate as the sole treatment modality, or it can be part of a treatment plan that also includes individual or family therapy. Groups for younger children are usually play therapy groups that focus on teaching social, play, and friendship skills, as well as self-control and appropriate behavior. 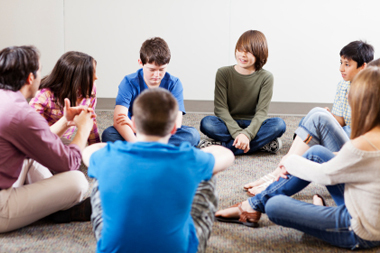 Groups for adolescents encourage expression of feelings through verbalizations, and they provide teens the opportunity to learn from other children as well as from the therapists. We also have intermittent groups for specialized populations on topics such as children going through divorce, support groups for parents with emotionally troubled children, and parenting classes. There are many approaches to family therapy, and we have the capacity to provide a variety of ways to structure therapy to meet the needs of a given family. One therapist can work with an entire family simultaneously, or if indicated, more than one therapist can work with different members of a family, integrating the treatment so as to accomplish the individual and family goals. Medication treatment for children and adolescents with emotional/neurological problems is a highly specialized area of expertise. The decision to put a child on medication is always one to be taken quite seriously; however, medication treatment can be a powerful component to the treatment of some disorders. We offer highly specialized assessment and treatment and an integrated approach in which medication, when necessary, is included as a part of the child's overall treatment plan. We have a Board Certified Child Psychiatrist on staff who works side by side with the child's therapist to facilitate efficient communication between providers. This results in quick turn-around times when medications need to be adjusted and easy transfer of ideas and hypotheses regarding overall care. The Sullivan Center has on staff several doctoral-level psychologists who have more than five years' experience post-licensure. They also have extensive experience in forensic/legal evaluations and have served as expert witnesses in court. A Custody Evaluation is a comprehensive unbiased evaluation of all parties involved in the custody dispute. Judges, attorneys, family court, mediators, or parents frequently request specific information about the dynamics involved in high-conflict divorce. The Center's philosophy behind all evaluations of this nature is to make recommendations and determinations that are in The Best Interest of the Child. The Center provides Forensic Psychological Examinations of children and adolescents involved in civil/personal injury cases. We assess brain damage and/or emotional damage resulting in loss or injury from accidents, child abuse, animal attacks and other sources. We provide Forensic Psychological Evaluations for juvenile offenders involved in criminal cases. Information requested from these evaluations usually involves competency, mental status, diagnosis and recommendations for treatment or disposition. An attachment assessment is a psychological evaluation of a child and adult (usually parent, guardian, de facto parent, foster parent) that assesses the nature and quality of attachment or bond between the two. Juvenile court, or attorneys, or the department of social services often request these evaluations, when termination of parental rights is an issue. Many different issues arise during a process of adoption. We can provide an evaluation that is tailor-made to meet the specific needs of the child and families. Common issues include clarification of the child's psychological strengths and weaknesses, determination of the presence or absence of significant problems, an assessment of cultural and ethnic issues, and clarification regarding the child's potential psychological response to adoption. This type of evaluation is especially helpful for older and/or high-risk children. Specific clinicians on staff provide consultations to attorneys and judges regarding mental health issues in cases involving children and adolescents. Issues that may arise to indicate the usefulness of a consultation could be: a) how to depose a child of a certain age or a child with a specific disability; b) how to examine or cross-examine a child; c) how to determine the child's ability to testify or the conditions that would facilitate his or her ability to testify; d) how to determine the need for a psychological evaluation; or e) to request a Forensic Evaluation. We can provide help with most psychological and developmental questions regarding children. Based on symptoms and specific referral questions, a battery of psychological tests is administered to provide accurate diagnosis and analysis of cognitive and emotional dynamics involved in the overall clinical picture. Comprehensive psychodiagnostic assessment is especially useful in complex cases where differential diagnosis is an issue, in cases in which the client is not responding to treatment as expected, and in cases in which previous attempts at treatment have failed. Learning difficulties can have devastating effects on a child's academic life and overall emotional adjustment. Understanding the exact nature and severity of the disability empowers parents to access appropriate resources for their child. It also provides guidance for educators regarding appropriate strategies to maximize the child's potential. This assessment involves a battery of tests specifically selected based on the child's age, and symptoms, to determine differential diagnosis. This evaluation is especially helpful for parents wanting a second opinion regarding a school assessment or for parents wanting validation for diagnoses such as ADHD. Clinicians at the Center will attend IEP meetings and present test results and recommendations, if the parents so desire. Neuropsychological Assessment involves a comprehensive test battery for clients with suspected or known neurological dysfunction or brain damage. It is also used for clients with very complex learning and functional problems whose dysfunction is not adequately understood on the basis of learning disability assessment alone. Cerebral dysfunction manifests in learning and behavioral problems that can be misdiagnosed as psychological in nature. It can co-exist with psychological diagnoses, often resulting in a child with complex symptomotology, who is resistant or non-responsive to treatment strategies that do not take into account the dual diagnosis. 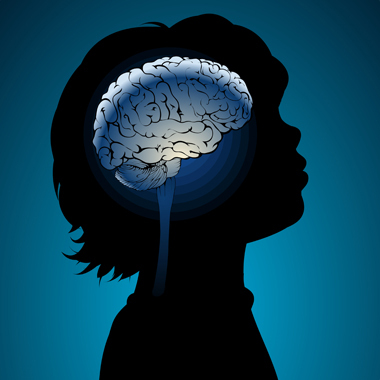 We specialize in neuropsychological assessment of young children through adolescence. We accept referrals from medical doctors, neurologists, rehabilitation centers, psychologists, psychiatrists, other mental health professionals, attorneys, courts, schools, regional centers, and families. David Fox, M.D., Board Certified Child and Adolescent Psychiatrist, provides assessment regarding the appropriateness of medication treatment. Medication treatment is helpful and necessary for many childhood and adolescent emotional disorders. For most children in need of medication, the combination of medication treatment and psychotherapy is the most effective treatment strategy. We have the capacity to assess the appropriateness of medication needs within an integrated assessment approach. In addition to primary care, the Sullivan Center provides consultative services to professionals and agencies. We provide in-service training regarding various aspects of child psychopathology and treatment. We also provide outside assistance and consultations for day-care centers, schools, treatment centers, and group homes serving emotionally disturbed and high-risk populations, regarding difficult and/or complex cases. Our staff also offers consultative services to individual therapists and professionals working with difficult treatment cases. We will work directly with the therapist or provide an independent evaluation of the child and family with a review of the records and treatment. The Center regularly contracts with agencies to provide services and programs. We have the capacity to provide on-site treatment programs for schools and group homes, residential facilities and other private or public agencies. We can design and implement assessment and treatment programs to meet an agency's specific need.